EL 4: Bach, J.S. : Aria Mit 30 Veränderungen BWV 988 "Goldberg Variations"
. . . [a] treasure-trove . . . spellbinding recording of Vivaldi's Stabat Mater sung by Michael Chance . . . almost every seminal recording contained in this collection features either Pinnock's English Concert at the peak of their powers or Gardiner's Monteverdi Choir and English Baroque Soloists at their most inquisitive (eg their iconic B minor Mass) . . . Pinnock's "Messiah" still ranks as the most emotionally eloquent recording of its generation, Reinhard Goebel's perspectives on Telemann and Heinichen concertos remain as compelling as ever and the English Concert's surveys of the Brandenburg Concertos and Corelli's Op 6 Concerti grossi remain rightly celebrated as an alliance of judicious execution, tasteful playing and natural sonorities . 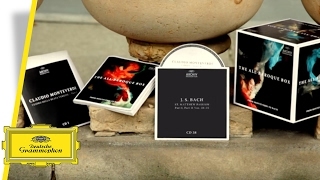 . . Les Musiciens du Louvre's bash through Charpentier's Te Deum, their passionate interpretation of Rameau's "Dardanus" and Musica Antiqua Köln's Soundtrack to the film "Le roi danse" present the bulk of the DG iceberg rather than merely its tip . . .